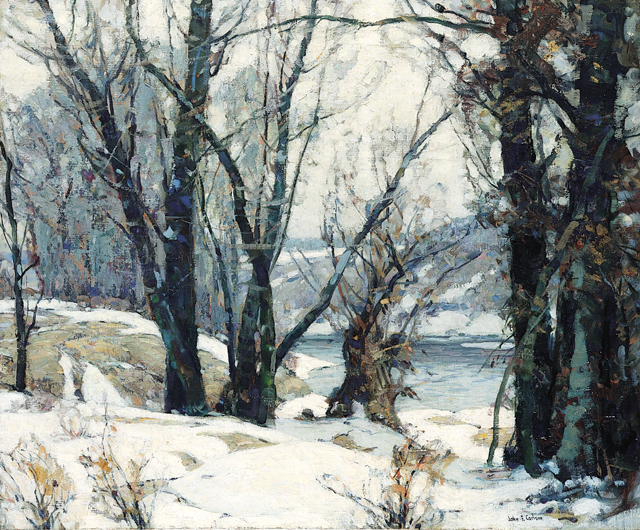 John Fabian Carlson (1874-1945), Winter Willows, c.1937, oil on canvas, 25 x 30 inches. Brigham Young University Museum of Art. This Swedish-born American Impressionist presents the viewer with an unpretentious snow-laden field typical of the many landscapes Carlson painted in the countryside of Woodstock, New York. Winter scenes allowed the artist to explore the decorative qualities so pronounced in the tracery of leafless branches as well as the numerous “sky-holes” found on barren trees. Carlson believed each tree had its own expressive personality and often used these sentinels as strong pictorial elements.